Sanden's next generation swash plate compressor. PX compressors are durable at higher speeds, have lower noise vibration harshness (NVH), and are variably controlled for maximum environmental benefit. 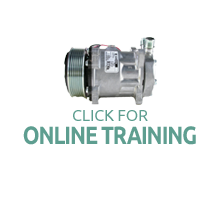 External control type varies compressor displacement without using an electromagnetic clutch. Sanden's fixed displacement "wobble plate" compressors. Models are available in fixed and variable displacement types.